The festive season is in full swing; Christmas lights are filling the streets and Christmas songs are already on the radio. This also means that the gift giving period is fast approaching and in case you were having trouble finding cute gifts, I’ve got you covered. Today I am sharing 1o gift ideas under €25, which are perfect for the women in your life. Barets have made their comeback this fall/winter season and I love it. You can find them almost everywhere but I fell in love with this light pink number from Topshop. Statement earrings are hot and happening this year. They are the perfect accessories to vamp up your Christmas outfit and the options are endless. Both Zara and Mango offer a huge selection. Socks are the perfect stocking filler item since they usually don’t break the bank. Choose a trendy fishnet or glittery pair or stay in the season with some cute Christmas themed socks. Delicate lingerie might not be the best gift for your mum or your best friend but a great gift for your partner or just as a treat for yourself. I believe that beautiful lingerie can really boost your confidence. I found this gorgeous bra at the &other stories, where they have several stunning options. Scented candles are one of my all time favorite gifts. They often look stunning and are a nice addition to people’s home that they might not quickly buy themselves. Nice candles don’t have to cost you a fortune, I found this one at the H&M for only €3,99. Inspiring or motivational books are a great gift for the entrepreneurs in your inner circle. #girlboss is a well-known example but I can also recommend babe, you go this to my Dutch readers. Mugs or glassware are a lovely gift for tea or coffee lovers. You can find some great options at the H&M home or the Anthropologie. Journals are a very thoughtful gift. I especially like this one line a day journal because you give people the opportunity to look back on every single day off the past 5 years. Make-up bags are something every woman needs. So why not surprise them with a nice looking one. I found this gorgeous velvet make-up bag for only €3 at the Hema. Mac lipsticks are a real beauty staple for many woman. Buy them their favorite shade or venture out with a different shade than they would usually go for. Motivational podcasts you need to listen to! Next Post How to boost your productivity! 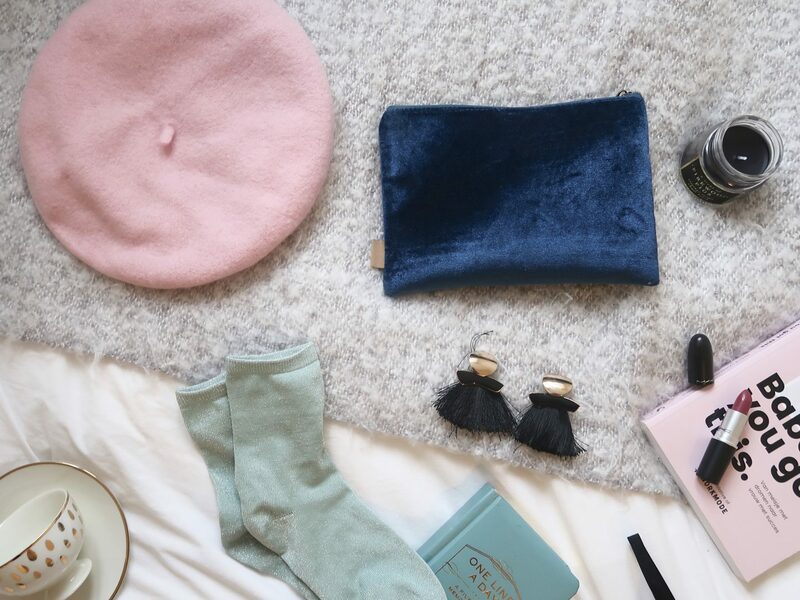 Wat een leuke items! Ik zou ook nog wel een baret willen hebben! ja barets zijn zo leuk! Wat een leuke tips. Dat boek wil ik nog altijd graag hebben!